It is important to trim shrubs around air conditioning units outside the home as overgrown shrubs can block necessary air flow to these units. These units then have to work harder because of limited air flow thus reducing the usable life of the units and increasing replacement costs. Shrubs that are covering units can also add to insect and pest problems as they have a direct path to the units themselves. 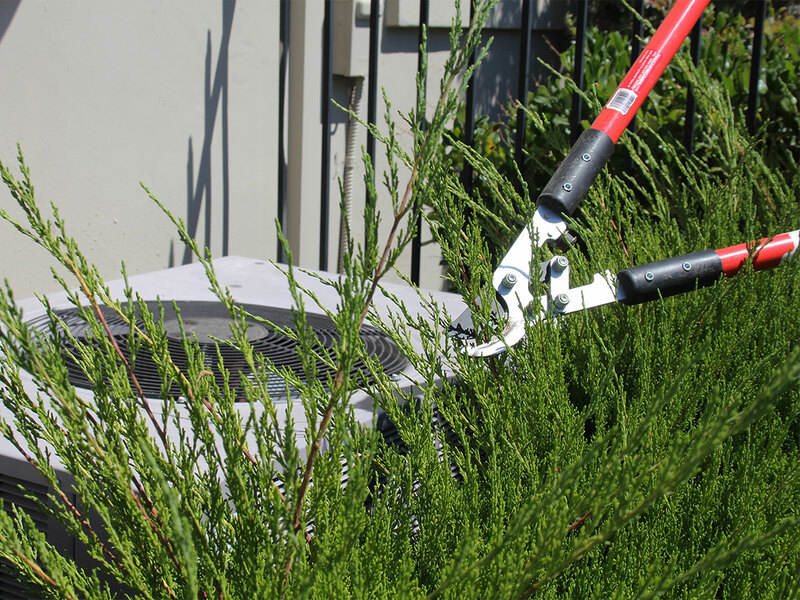 Use a pair of garden shears to trim away any overgrown shrubs that are touching and blocking the air conditioning condensing unit outside. You may want to trim any tree branches that hang over the unit as well as these can drop lots of leaves into the unit in the fall. When the fan is not on, clear out any leaves, grass, or dirt build up around the unit as well. You want to unit to be free and clear so that nothing is impacting the air flow around the unit.